Our mission is to come to Christ in Worship (Psalm 95:6); connect with other believers in fellowship (1 Cor. 12:14); grow in spiritual maturity through discipleship (Eph. 4:15); serve others through ministry (Gal. 5:13); and go reach the lost through evangelism (Matt. 28:19-20). The Young Adult Ministry is all about Young Adult Life. It is the environment where young adults (ages 18-35) can experience worship and teaching that is focused on a topic relevant to their stage of life. All Young Adults (ages 18-35) are invited to join us every 3rd Sunday for a great time of fellowship over breakfast. After breakfast, we will attend the 11AM Worship Service together. New Year. New Series. New Connections. Join us this February for our Young Adult Bible Study "Follow" by Andy Stanley! This Bible Study will take place on Wednesday Nights at 7:00p starting on February 6, 2019. Young Adult Life is the environment where we can experience worship and teaching that is focused on a topic relevant to our stage of life. From Small Group Bible Studies to The Young Adult Experience, Young Adult Life is the place where we connect with one another. **Stay connected with us by clicking below. The Life Changers College Ministry serves college students between the ages of 18 to 24. The mission of this ministry is to evangelize and address the spiritual needs of all college students. Our College Ministry aims to serve students while they are in college. 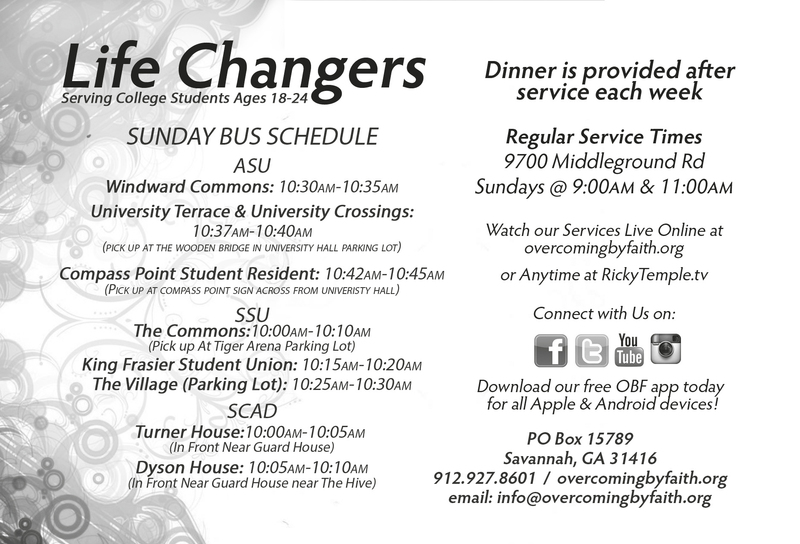 We offer free Bus Transportation to our 11am Sunday Worship Services PLUS we serve a free College Dinner. CLICK 'LEARN MORE' for Bus pick-up times & locations for your campus! Whether you are Single or Married, the Young Adult Ministry is for you. We offer small group gatherings and Bible Studies that meet the season of life that you are in PLUS, you get the amazing opportunity to meet other young adult Christians who are just like you with the same needs, aspirations, and hopes that you have. So lets connect! Come meet us at our next event or connect with us on Facebook to stay in the loop of all things Young Adult.